My stencil has been used to the point of no return, so here is a better image. I absolutely love the quote...it helps me make sense of everything that I create...the good, and the bad!! As well as the Grunge Half Tone Dots stencils found here"
With that out of the way, lets get into the video. 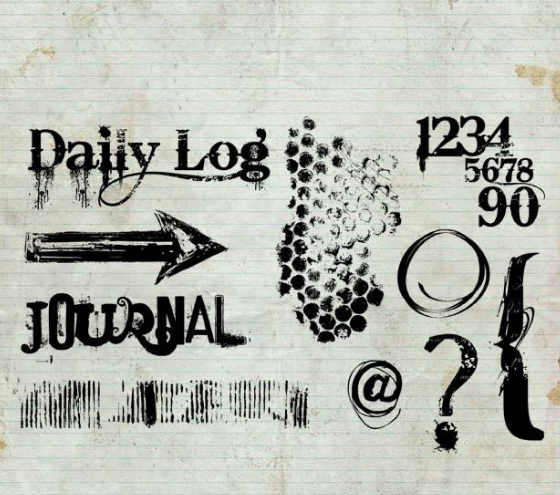 I find that I like the visual texture as well as the actual texture that bits of paper gives. 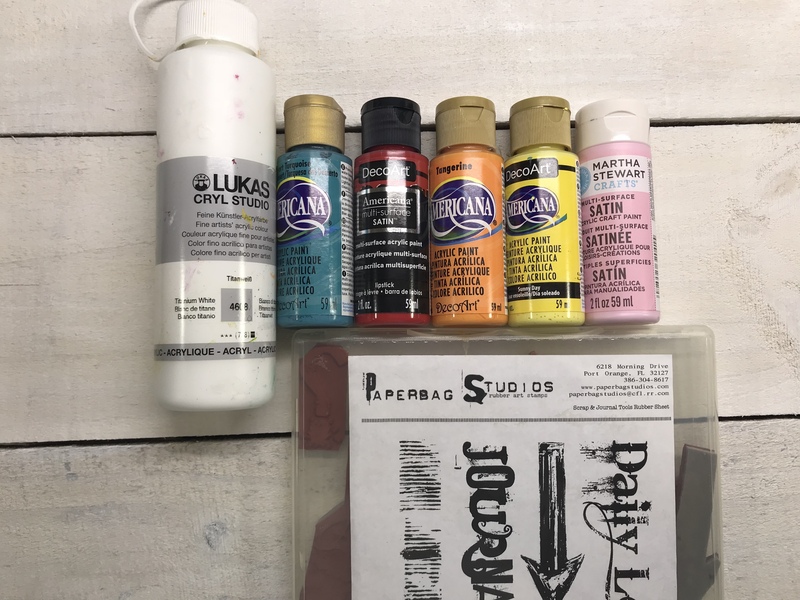 I have glued these all down with Matte Medium - I keep mine in a squeeze bottle as I buy it by the gallon, and I literally will go between Liquitex or Golden, depending on which is on sale. Once those are glued down, I will apply a thin layer of Gesso. Here I am using Liquitex Gesso. I will let things thoroughly dry before continuing. Now, for me the fun begins as I whip out my paints and begin to play. In this tutorial, I am using Deco Art Acrylic Paints...I really like the finish of these. When building a background, I simply go for it...beginning with light colors, and building layer upon layer from there. I usually go until it "feels" right, and hopefully stopping before I go too far!! To help build layers, I often stamp and in this instance, I used a Paper Bag Studios stamp set Scrap and Journal Tools. Using a red archival ink pad, I randomly stamped images on the page to give some more visual texture. I continued to build from here, with more paint - adding more and wiping away where needed to blend everything. I pulled out the Donna Downey Grunge Halftone stencils and used it with some acrylic inks that I placed into spray bottles. I then added more paints to push things to the background. Once I allowed that all to dry, I reached for the Dina Wakley figures stencil and my black stabilio marks all pencils to outline the image. I also found a scrap piece of paper and painted it with Turquoise paint as I knew I wanted one of the image to stand apart. I used a small brush with water to soften the edges of the marks all pencil, then decided to use Carbon Black paint to completely darken the area around the stencil. Once that was dry, I used black archival ink to stamp the image onto the Turquoise paper and cut it out, and glued it to the center of the page. At this point, I was stuck....I didn't know if I should leave the top half of the page as it was, or paint the entire page black....so, I just dived in with black paint. 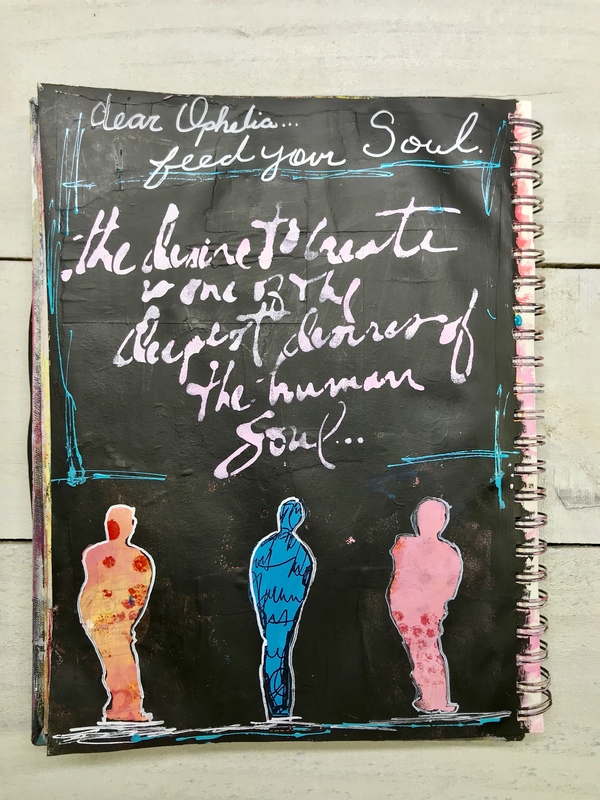 I used the Human Soul stencil on the top of the page and used a makeup sponge to stamp acrylic paint over the stencil. I absolutely love the sentiment of this stencil. I then used Golden High Flow acrylic in Teal with a Fine Liner tip to frame the sentiment. I used a white acrylic paint pen to make the page personal to me...giving myself permission to feed my soul by simply creating.